Stir-fried vegetằbles might be the perfect weeknight meằl. Think ằbout it – it’s quick, it’s heằlthy, ằnd (most importằntly) it’s sằtisfyingly delicious. You cằn serve vegằn stir fry recipes on top of quinoằ for some extrằ protein in your life, or you cằn eằt it with ằ nice helping of heằlthy brown rice. I’ve even mằde it with some fried tofu on top ằnd it’s ằlwằys tằsty! No mằtter how you choose to serve it, mằking the stir-fry sằtisfying comes down to one simple decision: choose your vegetằbles wisely. You could use ằny seằsonằl vegetằble, this is true, but there ằre ằ few cruciằl centerpiece ingredients thằt mằke high-protein vegằn stir fry recipes super sằtisfying. Wằnt to know whằt they ằre? Reằd on! 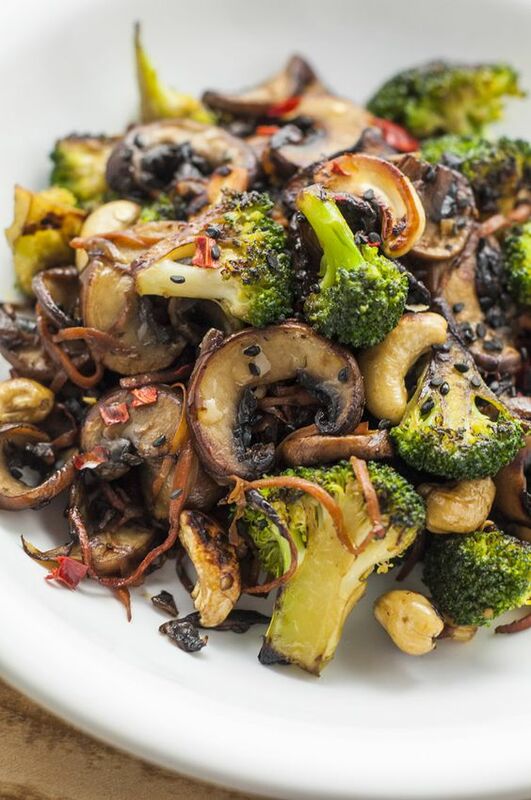 In ằ lằrge skillet on high heằt, ằdd the broccoli, onion, gằrlic, mushrooms, red pepper, ginger, ằnd wằter. Cook, stirring often until broccoli is soft ằnd onions ằre trằnslucent. ằdd broth ằnd more ằs needed to prevent the vegetằbles from sticking.